Fast processor and memory designed for video: With an Amlogic S905x Quad-core CPU, 1GB RAM and 8GB Flash storage, your movies will play smoothly and load faster. Digital Surround Sound: All sound formats from 2 channel stereo to 7.1 Dolby Digital passthrough. Also Flac lossless HD audio is supported. DLNA: Playback content from your locally networked DLNA devices. Store movies, videos and photos on a computer in the house and you can access them on the media player using DLNA. Ethernet connection (LAN): With 10/100 ethernet, connect a standard cat 5 cable to a RJ45 network port (like on your router/modem) to get a fast and secure connection. Android 6 OS: Android opens a world of limitless possibilities through the Google Play store. Games, video players, APPs utilities and lots more. USB Ports and Micro SD Input: Connect USB flash drives, hard drives or input devices like mice, keyboards or webcams or read content from a Micro SD card. The Amlogic S905x Cortex A53 will hardware decode your codec to ensure smooth playback every time. Software decoding isn’t the best option because it’s not terribly efficient. Building a hardware decoder into a chip allows for more efficient operation, which means better performance on chips with a modest grunt and improved efficiency. 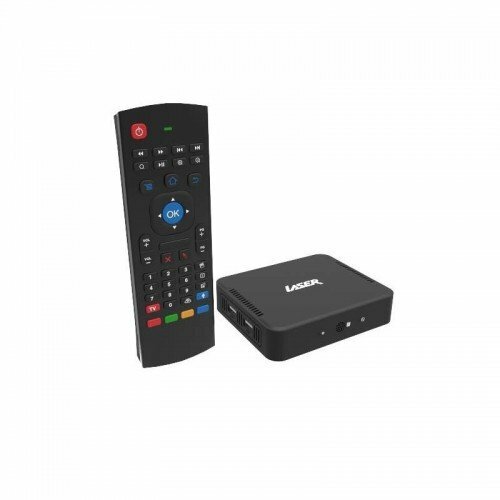 The Amlogic S905x Cortex A53 has been designed specifically for Media players. Quad-core ARM Cortex A53-based SoC with ARM Mali-450 GPU running at 600 MHz with hardware support for decoding up to 4K. Some Cortex A53 chips in the market such as the Amlogic M802 have been designed for tablets. They will support software decoding of 4K but will not support hardware decoding. The Laser MMC-P20Plus Smart Media Player uses the Amlogic S905x – Same as S805 but adding extra video decoding up to 4K and UHD support. This makes it more future proof than S805, and it could potentially be used as a media centre with a USB hard drive and Gigabit Ethernet connection. The S905x is the first Amlogic Media Player chip capable of streaming 4K media content. Amlogic S905x - Quad-core ARM Cortex-A53 (up to 2.0 GHz) with a Mali 450 GPU, supports hardware decoding up to [email protected] for multiple formats. Transform your TV or monitor into a smart Android device with the LASER 4K UHD Smart Media Player. Quad-core CPU with 8Gb of storage and support for 4K UHD @ 60FPS ensures clean video playback. Android OS allows for unlimited expansion and USB, HDMI, network LAN, DLNA, Wi-Fi and Bluetooth gives you limitless connectivity options. Turn any TV into a smart device with this multi-purpose entertainment solution that brings APPs, movies, music and more together. The MMC-P20Plus comes with an Airmouse. With built-in keyboard for easy navigation. 3 key feature benefits 1) Amlogic 905x Quad-core CPU supports 4K playback and UHD content. 2) Includes the latest Android 6 operating system with Kodi media software. 3) Wireless Airmouse included.